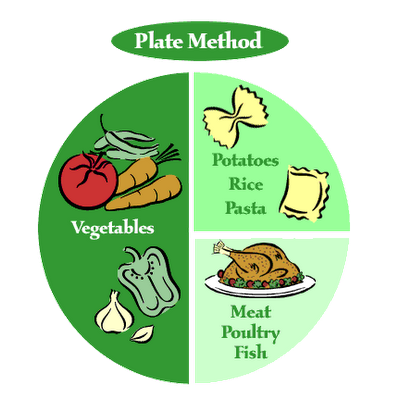 Using the Plate Method – Nutrition.Health.Life. Every time I tell someone I am a Registered Dietitian they ask me how they can either 1. be healthier or 2. lose weight. One of the simplest ways to do both of these (since being healthier often results in losing weight) is by using the Plate Method. There are very few people I know that actually enjoy counting calories or pre-planning their exchanges at each meal, so an easier to follow method was developed. The image above shows how simple it is create a healthy plate. Divide the plate in half and fill one half with non-starchy vegetables (all vegetables except potatoes, corn, and peas). Next, split the other half into half. Fill the top right corner with a starch (pasta, rice, bread, potatoes, etc…). Lastly, fill the remaining quarter with lean meat (poultry, fish, lean beef, etc…). In addition to this plate, you can add one serving of milk and fruit to each meal. This method can also work for mixed dishes. For instance, if you make stir-fry, try to include the portions relative to the plate. Try to fill your plate with equal amounts of pasta and meat and then add twice the amount of vegetables.